Current Affairs 9th February 2019: Instantly obtain Latest Current Affairs 9th February 2019 with all essential info, Be the first to know all the Current affairs 9th February 2019 top news, Major Issues, Current happenings, Important events in National as well as International level with clear explanation. 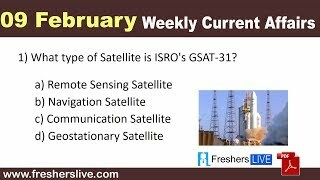 For all competitive exams and Interviews, equip yourself with the Latest Current Affairs 9th February 2019 granted here. Father Francois Laborde, a 92-year-old priest, conferred with the Legion d’Honneur, the highest civilian award of France, in recognition of his work for specially-abled children in Howrah. He was entitled by the French Ambassador to India, Alexandre Ziegler. Father Francois Laborde, French-origin with Indian citizenship,is considered to be the third person from the state to be entitled with the Legion of Honor after film maestro Satyajit Ray and actor Soumitra Chatterjee. Defending champions Vidarbha won the Ranji Trophy 2018-19, which is the 85th season of the Ranji Trophy by defeating Saurashtra. This victory is their Successive victory since they won the Trophy last year. The 5th India-Bangladesh Joint Consultative Committee Meeting will be held in New Delhi. External Affairs Minister Sushma Swaraj and Foreign Affairs Minister of Bangladesh Dr A. K. Abdul Momen will co-chair the meeting. The two sides will also sign agreements after the meeting. The last Joint Consultative Committee Meeting between the two countries was held in October 2017 at Dhaka. The Go Green initiative, Lieutenant General Surinder Singh, General Officer Commanding-in-Chief, Western Command inaugurated a 2 MW solar power plant at Chandimandir. This is the largest Solar power project within Western Command of the Indian Army, set up at Chandimandir. Considered as one of the largest, the solar power plant in Panchkula (Haryana) was established with an investment of Rs 10 crore. A solar plant generating 3.5 MW of power was inaugurated in Kempegowda International Airport (KIA), Bengaluru Karnataka. KIA currently meets 67% of its energy requirements through solar power. It is now aiming for 100% reliance on renewable energy by 2020.